Let us help you achieve your goals with our state of the art therapies. Cleared by the FDA for pain management and skin care, Celluma uses light energy to improve cellular health by accelerating the repair and replenishment of compromised tissue cells. While similar devices on the market claim to do the same, they often require you to buy multiple panels and accessories in order to treat specific conditions or accommodate different parts of the body. In its portable form it is known as a TENS unit. Interferential current therapy is a deeper form of the common treatment TENS. The frequency is higher at 4000Hz from interferential current therapy compared to the same signal released by a TENS unit at low frequencies of 5-160 Hz per second. The IFC’s high frequency waveform reaches the skin deeply with a higher level of stimulation and less discomfort to the patient. Cold Laser Therapy or Low Level Laser Therapy (LLLT) is a treatment that utilizes specific wavelengths of light to interact with tissue and is thought to help accelerate the healing process. 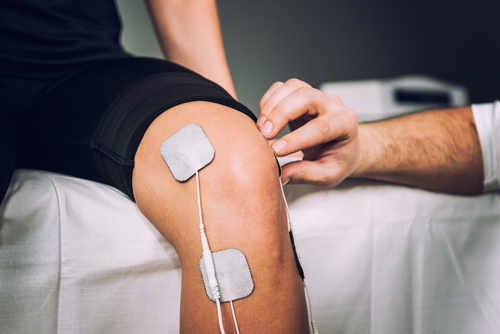 It can be used on patients who suffer from a variety of acute and chronic conditions in order to help eliminate pain, swelling, reduce spasms and increase functionality. Cold lasers are handheld devices used by the clinician and are often the size of a flashlight. The laser is placed directly over the injured area for 30 seconds to several minutes, depending on the size of the area being treated and the dose provided by the cold laser unit. During this time, the non-thermal photons of light that are emitted from the laser pass through the skins layers (the dermis, epidermis, and the subcutaneous tissue or tissue fat under the skin). This light has the ability to penetrate 2 to 5 centimeters below the skin at 90mw and 830 nm. For years, physicians have been using cold laser therapy on patients who are seeking effective, alternative methods for pain relief. Since 1967 there have been over 2,500 clinical studies published worldwide. Many of these studies are double-blinded, placebo-controlled and have demonstrated cold laser therapy to be a proven method for pain relief. However, many of these studies were done with small groups, so further larger studies need to be completed. For example, one issue that needs to be studied further is that there does not appear to be a uniform standard regarding the dose and number of treatments. The effectiveness of cold laser therapy for neck pain was recently reviewed by The Bone and Joint Decade 2000-2010 Task Force on Neck Pain, an initiative conducted by a multidisciplinary team of researchers and clinicians. Hurwitz, EL, Carragee EJ, vander Velde G, et al. Treatment of neck pain: noninvasive interventions: Results of the bone and joint decade 2000-2010 task Force on neck pain and its associated disorders. Spine 2008;33:S123-152.